When I left my windowless motel room from the night before I discovered that it was pouring down rain from a storm that was blowing across the state from the southwest. I probably thought for about a half a second about staying in town for another night, but I really wanted to make it to the town of Houston where I had mail and a new wheel waiting for me. I haven't been writing about my ongoing wheel problems because it would just be redundant. I've probably had close to a dozen broken spokes so far, and have had the wheel tended to by bicycle mechanics in two different towns along the way. After breaking another spoke yesterday my wheel started wobbling so badly that I opted to simply open up my rear brakes instead of using one of my precious few spare spokes to fix it. But with the rain pouring down today I decided I needed both of my brakes working, so I once again tweaked the wheel enough to get it to stop rubbing with every revolution. Just a few miles outside of Eminence I came across David Clark seeking shelter from the rain in a carport alongside the road. It turned out that he and I had probably never been much more than a mile apart yesterday, with both of us stopping for separate lunches in Ellington and ending the day in Eminence. 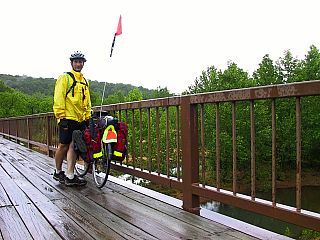 David was trying to decide between riding back into Eminence for the day versus staying in the carport until the storm blew over. Since I really wanted to make my mail stop for day I hadn't really considered doing anything but riding on, and we parted ways once again. In the heart of the Ozarks I stopped to visit Alley Spring, where an astonishing eighty million gallons of water a day gush forth from the ground. 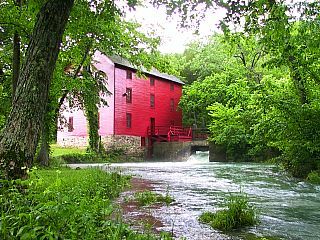 An old red flourmill, built in 1895, still stands on the site and I lingered awhile to take some pictures and do the tourist thing. After leaving the mill I realized that I would have to ride pretty briskly to catch my mail before the Post Office closed for the day. Not having time to stop and eat a real lunch, I slammed down a slice of pie and a bottle of fruit juice to get my blood sugar going and then started pedaling for all I was worth. I made it to Houston with just fifteen minutes to spare, and I picked up my forwarded mail and the new wheel that REI had shipped to me. It seems like I've been riding on my failing rear wheel forever, but I can't fault REI for the attention they gave me as soon as they learned I was having problems. They had a new custom wheel hand-built for me and shipped it to the address I requested as soon as it was ready. Checking into a motel for the night, I was destined for an evening of bike repairs and web updates. After about an hour of swapping parts I had my bike put back together with a wheel that looks as rock-solid as can be. Today marked another milestone with my passing 1,500 total miles ridden. Besides being a nice round number, this means I'm a little over one-third the way across the country. To be honest, when I began this journey I wasn't completely convinced that I could handle the riding. But as I write this I've got not only the Appalachians, but also the most difficult part of the Ozarks behind me. I've dealt with the most physically demanding part of getting across, and from here it is purely a matter of dedication. Well, just in case anyone actually reads these besides me, this is Nick here. I really appreciate the comments everybody has being leaving. Sometimes I look at the computer gear as the only thing I have left to ditch to save weight, so it is really motivational to know that someone cares about the posting I do here. Things are going fine, and I'm still enjoying myself more than anything else. The future may be cloudy for me, but at least I know how I'm spending the summer. Continuing to thouroughly enjoy your updates and adventures. If your wondering about what to do at the end of the summer, why not come visit South Africa and turn-it into an 'endless' summer adventure - maybe you could give horse riding across Lesotho a try? I am definately still checking up where you are. Every day I come into work, being a bit bored with a desk job myself, and check to see if you have made any updates. I thoroughly enjoy your missives. I am sooooo glad to hear that you are on a new wheel. What a relief that will be. If you happen to be in the Portland, Oregon region lemme know if you need a place to crash. While you have been on your cross country journey, I have been sloughing off and laying on the beach these last two days. Congrats on the 1500 mile mark by the way. My riding has been mostly limited to morning spin class 3x week. But I sometimes imagine that I am a real bike rider. Only I get a shower and a steam bath after my hour is up! Don't ditch the computer! I love reading your entries. I am 7 months pregnant and won't be cycling at all this summer, so I'm living vicariously through reading your journal and others. I love your site--it's beautifully designed. Do you know any of the people reading your entries and posting messages? I am still following your trek and still willing to pick you up if needed. I am very impressed with the 1500 mile mark. Well, the fans have spoken and I will haul this computer to the end of the earth if I have to. I guess my only choice to get weight off the bike now is an emergency liposuction, and I'm not going to go there. Mmm....Great visual Nick, great, great visual.